The Best Item In An Astronaut's Care Package? Definitely The Ice Cream : The Two-Way Unlike other cargo vehicles, the SpaceX spacecraft can return to Earth without burning up. So it's equipped with freezers for transporting medical samples — and the occasional frozen treat. 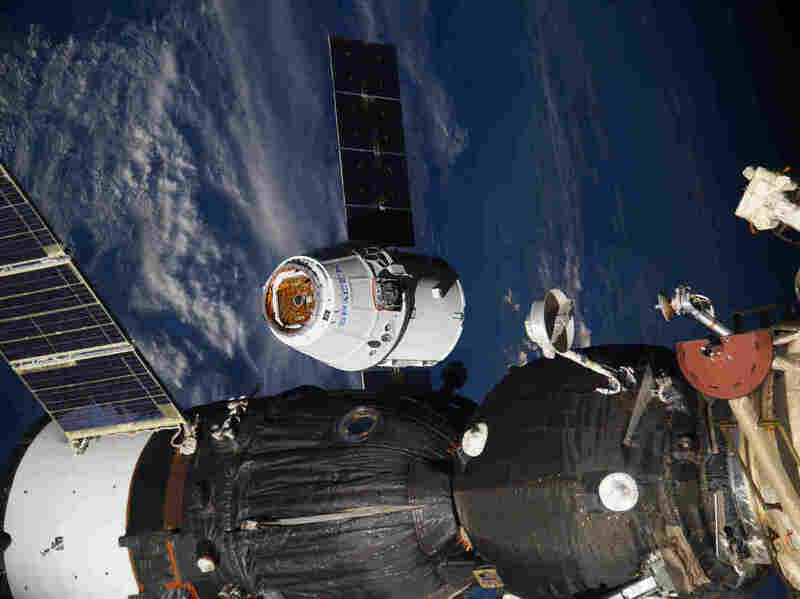 In this photo taken by Russian cosmonaut Sergey Ryazanskiy, the SpaceX Dragon capsule arrives at the International Space Station on Wednesday, stocked with scientific equipment, supplies — and ice cream. A SpaceX craft docked at the International Space Station on Wednesday carrying more than 6,400 pounds of lab equipment and supplies for crew members living there. But perhaps the most eagerly awaited cargo on the resupply mission may also be its most perishable: ice cream. We all remember astronaut ice cream, those little dehydrated bricks of neopolitan. The reason astronauts generally don't have much access to the real stuff isn't rocket science, but rather something we've all encountered: a lack of freezer space. What limited refrigeration there is on the space station is given over to blood samples, urine samples, etc. — stuff you don't really want next to your Moose Tracks. Unlike previous cargo vehicles used by NASA, the SpaceX Dragon capsule has the ability to return to Earth without burning up on re-entry. That means it can bring stuff back. The spacecraft is equipped with freezers to transport medical and scientific samples back to Earth. And sometimes, those freezers are empty when they go up to the station — which leaves room for ice cream, Vickie Kloeris, manager of NASA's Space Food Systems Laboratory, tells NPR. Before the capsule lifted off atop a Falcon 9 rocket from Florida's Kennedy Space Center on Monday, she says, NASA's cold storage team packed it with a sweet array of frozen treats: 30 individual cups of Bluebell ice cream and some Snickers ice cream bars. Astronauts Jack Fisher and Paolo Nespoli used the station's robotic arm to successfully capture the Dragon, beginning a tasty race against the clock. The freezer space needs to be emptied within a few weeks so that there's room for crew members to send medical samples back home. "It's a really special treat, but when it gets there, they have no place to put it," Kloeris says. "It's tough duty, but they'll manage to eat it in the time allowed." Crew members can also tell NASA what they'd like receive in the "fresh-food kit" the agency sends. These foods — things like citrus fruits and carrots — are transported at ambient temperature, so they need to be able survive up to a week without refrigeration and still be edible once they reach orbit. "And then we usually throw in a surprise or two," Kloeris says. This time, NASA sent some unrequested avocados and apples — in part because the crew members didn't ask for any fresh food at all. "We were like, this is crazy. We're not going to send a fresh-food kit without putting something fresh in there," Kloeris says, noting that the crew asked for reinforcements of coffee and condiments. As NASA moved from two-week manned space shuttle missions to supporting astronauts living at the International Space Station for six to 12 months, Kloeris says the agency learned to take the psychological role of food much more seriously. "On the shuttle flights, because they were short, the food was just not all that important," she says. "Most of [the astronauts] took the attitude, 'Oh, it's a two-week camping trip, I'll find something.' "
For shuttle flights, astronauts would choose all their own food based on their personal preferences. "And that worked great on shuttle," Kloeris says, "because the food and the crew member were on the same vehicle and never got separated." But NASA tried to take the same approach with the space station — "and it was a horrible failure," she says. That's because the cargo, including food, was generally sent separately from the crew members. The timing of the cargo shipments never quite lined up with the arrival of crew members, so for a portion of the time astronauts were in orbit, they were eating food that someone else had chosen. "That became a huge psychological issue," Kloeris says. "We had so many complaints." So she and her colleagues created a new standardized menu that NASA ships to crew members, designed for maximum variety and limited repetition. Kloeris says the more time crew members spend in space, the more important food becomes. "Now," she says, "all the managers in the space station program are aware how important it is to be sure these crew members get coffee the way they like it."